To prepare peanut sauce, deep-fry garlic and chilies in a bit of oil for 3 minutes. Drain. Combine chilies, shrimp paste, salt and palm sugar in a food processor or mortar and pestle. Grind into smooth paste. Transfer to bowl and dilute with water. Deep-fry peanuts and grind the peanuts until slightly coarse. To prepare omelette, combine egg and tofu cubes in a bowl and make 5-6 omelette in a non-stick pan. To serve, mix sauce with ground peanuts. 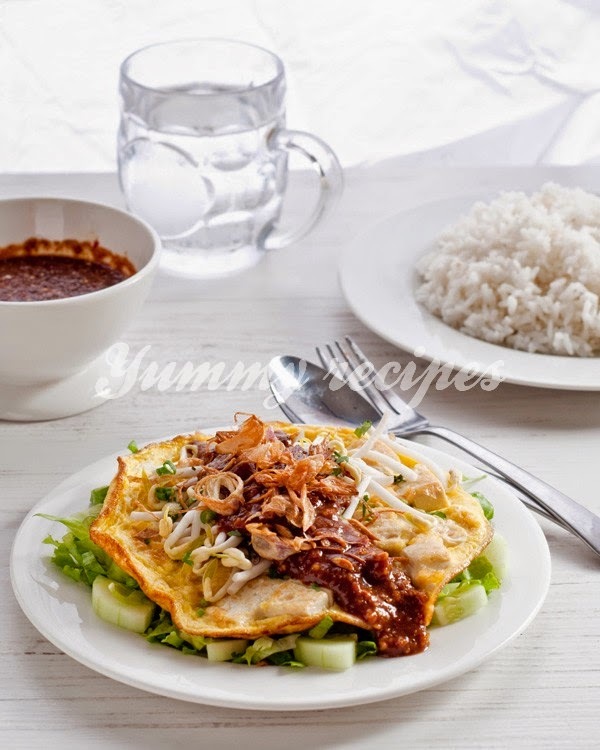 Arrange lettuce, cucumber, omelette and bean sprouts in an individual serving plate. Sprinkle chopped spring onion, celery and shallot flakes. Pour peanut sauce on top generously.